A couple of weeks ago, I was looking up information on a song called "Crazy Words, Crazy Tune" for a possible Wacky Wednesday post, a tune that I knew mostly from '60s era neo-jug bands. 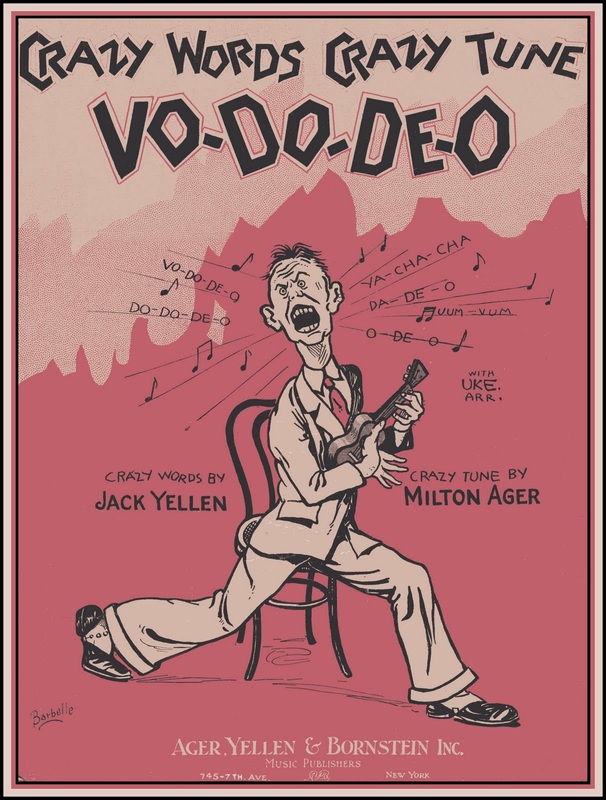 I found the names of the songwriters -- Jack Yellen and Milton Ager -- then quickly discovered that the pair had been responsible for some of the most memorable songs from the Roaring '20s, archetypal American touchstones of the Jazz Age. 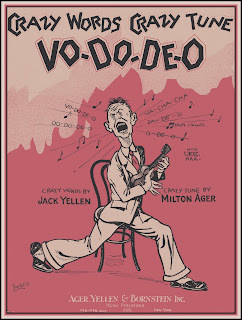 Yellen , the one who wrote the lyrics, and Ager, who wrote the music, were responsible for so many hits, they could be considered the Leiber & Stoller of the Prohibition Era. Yellen was born Jacek Jeleń in Poland in 1892, immigrating to the U.S. with his family when he was five years old. He grew up in Buffalo, N.Y. and for a few years worked as a reporter for The Buffalo Courier. But even then he was writing songs on the side. He died in 1991. Ager was born in Chicago in 1893. He's got connections to journalism also. His wife Cecilia Ager was a film critic and reporter for Variety as well as The New York Post Magazine and other publications. Their daughter, Shana Alexander wrote for Life magazine and sparred with James J. Kilpatrick on the "Point/Counterpoint segment of 60 Minutes. Milton Ager died in 1979. So what songs did these two write? Let's get to those. One of their earliest hits was one called "Big Bad Bill is Sweet William Now." The earliest recordings of this were in 1924. Margaret Young and Billy Murray were among the stars who recorded it that year. "Big Bad Bill" has several contemporary versions as well. Van Halen recorded it in the early '80s. But I prefer Merle Haggard's dandy version. An even better-known song by this duo was "Hard-Hearted Hannah," also published in 1924. Here's a version by Lucille Hegamin. Another Yellen & Ager classic is "Ain't She Sweet," written in 1927. One of the first recordings was by Ben Bernie and His Hotel Roosevelt Orchestra. A British singer named Tony Sheridan recording this one, backed by a then-unknown band called The Beatles, in 1961 when they were living in Hamburg. But probably Yellen & Ager's most enduring tune is "Happy Days are Here Again," a basic Chins-up-America tune written in 1929 and later adopted as the 1932 campaign song for Franklin Delano Roosevelt. The Democrat Party adopted this as it's own theme song, often played during national conventions. But, according to The New York Times' obituary for Yellen, the lyricist considered himself a Republican. And here is the song that led me on this chase, a 1927 version by Frank Crumit of "Crazy Words, Crazy Tune," in which a nutty neighbor with a ukulele inspires homicidal fanrtasies. I still might do a Wacky Wednesday on this one some day.